The 13th Young Chelsea Skat tournament was held on Saturday June 26th 2010. The hands were dealt at the table rather than our usual synchron format, and only the final session was seeded. We had 20 entrants including 4 guests from Denmark. Patrick Cherlet could only play 2 sessions, and David Parlett 3. 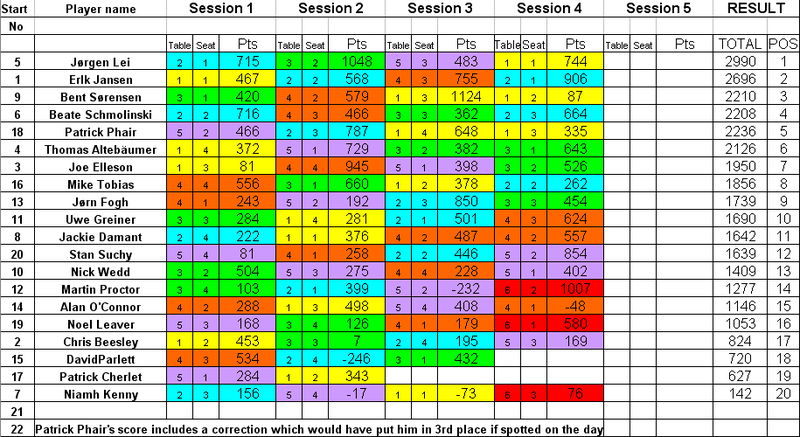 The first 3 sessions had 4-player tables, with a 3-player table in session 3, and the final session had 6 tables of 3. 4-player tables played 24 hands, 3-player tables, 18. The outstanding performance was from Jørgen Lei, who led all the way and won comfortably. Of the 72 hands he took part in, he played 26 contracts, losing only one, and in addition defeated 15 enemy games, 4 more than anyone else. Highest hand	Erik Hansen	192, GH with 4, schwarz. N.B. Patrick Phair should have earned 3rd place, but an error (his own) on the scoresheet gave him 50 fewer points on the day. Joe Elleson also scored a 192, GH with 4, schneider announced. Erik won on a tiebreak with one of the 2 scores of 168.